It used to be Glasgow Green, but that was before the sun shone for a month while the council watched and did nothing. This morning we went for a walk down to Glasgow Green. It’s ages since we’ve been there and had heard that all the grass had been burned away by the excessive heat and the lack of rain for the past month. We found a cordon running all the way around the frazzled grass from the People’s Palace to the McLennan Arch, while teams of gardeners worked at laying turf and watering the little bits of grass that have survived. Apparently they are preparing it for the 2018 European Championships which are due to begin on the 2nd August. I think they may be hiking to get it finished in time. However, if they had, during the dry spell, taken some time to assess the damage that was being done to the grass from all the events they were running and put in some work to repair it, there wouldn’t have been this last minute rush to fix things. Too busy rubbing their hands at all the money they were making. Shortsighted as usual. Still, we don’t live in Glasgow region, so it won’t be our Council Tax that will be paying for the re-turfing of The Green! One thing’s for certain, the money won’t be coming out of Glasgow Council coffers. Today we lifted our first tub of potatoes and got a fair few for our efforts. The variety was Charlotte. We forgot to weigh them, but our estimate is about 850g. Not bad from only three seed potatoes. 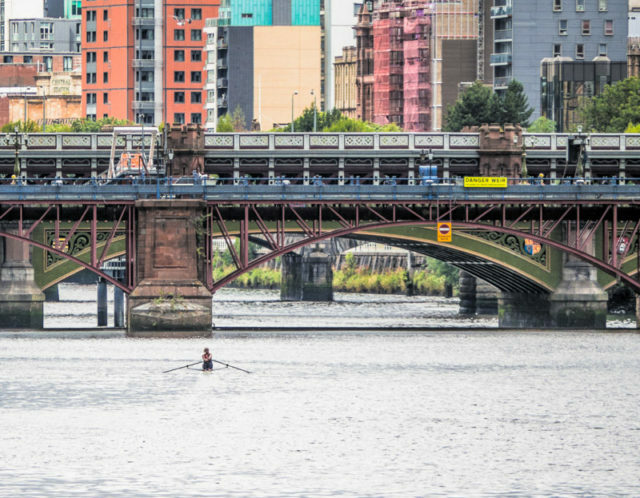 Today’s PoD is from the visit to The Green (or should that be The Brown) this morning and is a lone sculler on the Clyde. I liked the way the buildings in the background seem to rise up and dwarf her. Tomorrow is the dentist and hopefully some salsa at night.